These Harry Potter Lego Sets make for amazing Harry Potter gifts for kids and even for adults. I think I am more fascinated by my son’s Lego City than he is himself. 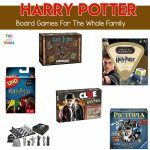 Be warned though, these Harry Potter Lego sets may just start a new Lego addiction in your home… but I promise, the playability, building and fun will be worth it! Harry Potter fans know that 90% of the action happens in Hogwarts Castle. 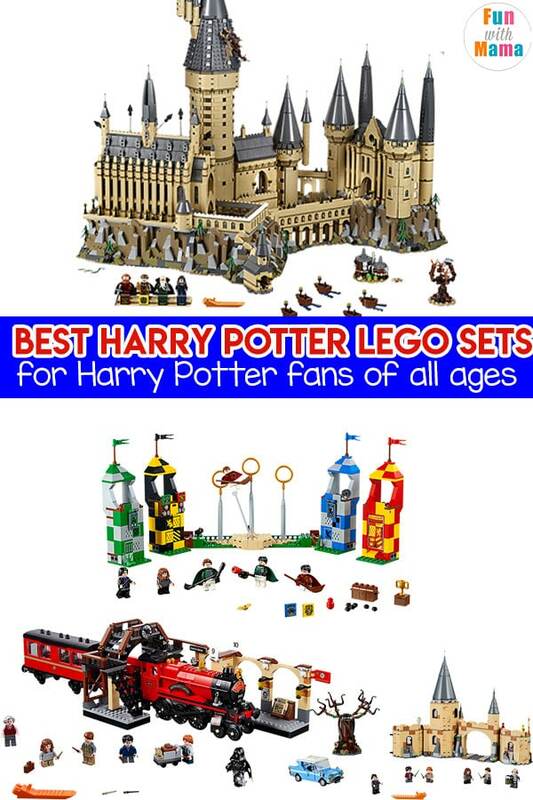 The Lego Hogwarts Castle should be the basis of any wizarding world creation and therefore the highest lego set of my ranking on these Harry Potter gifts for kids. 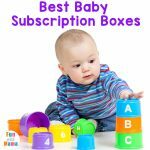 There are 3 instruction booklets, 10 numbered bags for pieces and endless play possibilities. Get the Hogwarts Castle here on Amazon. This set is perfect for children because of the price point and playability. It includes 10 minifigures including Harry Potter, Ron Weasley, Hermione Granger, Draco Malfoy, Susan Bones, Professor McGonagall, Professor Quirrell with dual Lord Voldermort face, Hagrid, Albus Dumbledore and Nearly Headless Nick. The Hogwarts Great Hall budiling has 878 pieces. Age range: It is perfect for children ages 9-14. The Whomping Willow has fun spinning branches, Flying Ford Anglia car model and a Hogwarts castle model piece. Minifigures: Harry potter, Ron Weasley, Hermione Granger, Seamus Finnigan, Argus Filch and Severus Snape. Pieces: there are 753 pieces in this set. Age range: Great for children ages 8 – 14. All Aboard the Hogwarts Express! Get to Platform 9 3/4 to begin your own journey. Ages: Great for children 8 – 14. This set is also currently on sale on Amazon! Check it out here. The playability on this sports themed Quidditch Match set is so much of fun! Which team will you be supporting? Slytherin? Griffindor? Ravenclaw? Hufflepuff? Minifigures include: Harry Potter, Hermione Granger, Severus Snape, Oliver Wood, Lucian Bole and Marcus Flint. Time to start your adventures with some new adventures. Face Aragog and the other spiders in the Forbidden Forest! Minifigures: Harry Potter and Ron Weasley. Ages: 7 – 14 years old. At the price point this is a sweet set that makes a great stocking stuffer or present just because. You can also find this set on Amazon with Prime Free Same Day Shipping! Lego sets are collector items and therefore many of the sets are only available for a limited time. If you see a set available on the Lego store, don’t wait on it. Buy it ASAP. Why? Because when these sets retire, the prices shoot up and they just keep getting higher and higher. This set is a retired discontinued set so that means the price is up there… but as we all know, Lego sets become collector items and many of you will purchase retired sets even if they are higher than their original price. This building includes 3 extensively detailed buildings and 11 minifugres. There are 2025 pieces. Here is another retired set that includes Harry Potter, Stan Shunpike, shrunken head, Hedwig owl and Ernie Prang minifigures. The Knights bus can be built into a London bus or a regular bus too. Pieces: There are 281 pieces included. Hagrid’s Hut incudes 6 characters: Harry Potter, Ron Weasley, Hermione Granger, Hagrid, Norbert and Aragog. It includes a light up fireplace too. 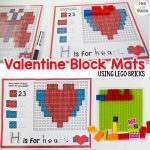 There are 442 Lego pieces. Minifigures can take your play to another level and often times they are really hard to find, or are only bundled within certain expensive sets. 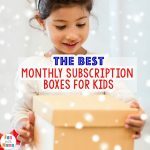 My kids love the mini figures so make sure to pay attention to what is included within each set and if your child’s favorite character isn’t, but the mini figure separately. 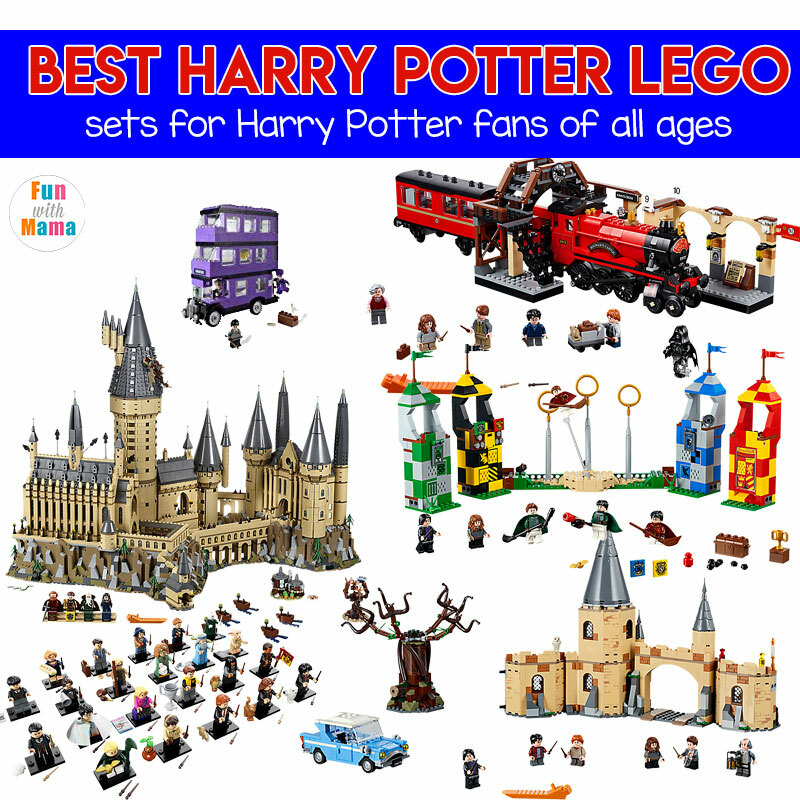 What is your favorite Lego Harry Potter set?